Xigbar, the Freeshooter, is the Organization's Number II and a master of space which he utilizes in battle with his twin arrow guns named Sharpshooter. 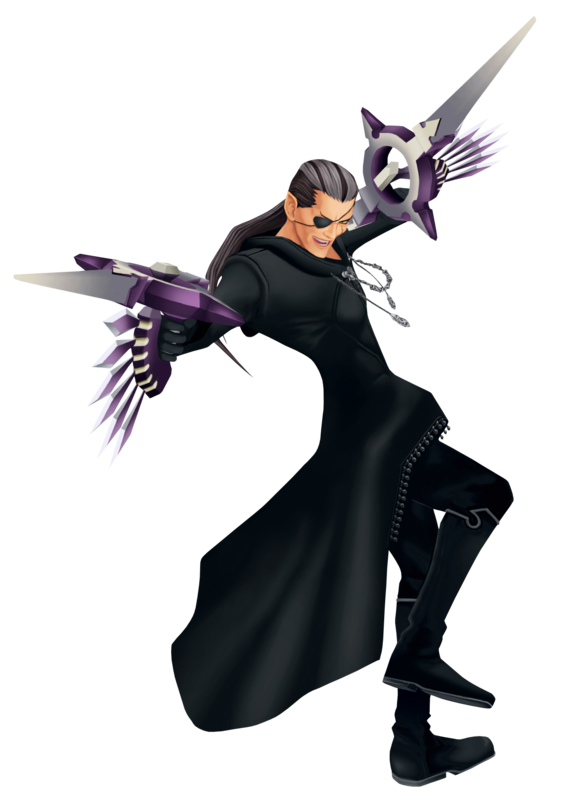 Xigbar is quick, witty and extremely sly when not laid back; he holds knowledge of events prior to Kingdom Hearts II that is central to the game's events, though he takes a much more backbench role as one of Xemnas' lackeys despite being a founding member of the Organization. Xigbar is first seen in Radiant Garden along with several other members of the Organization. While the other members keep their lips tight during their visit lead by Xemnas, Xigbar is quick to taunt Sora and pals about the Organization's power before he leaves on an irksome comment about how Sora looks at him whose significance Sora does not understand. He is not seen for a very long time until he is encountered in The Land of Dragons, skulking around suspiciously in his hooded cloak. He is confused for Riku and affirms that he is no such person, after which he uses his Sniper Nobodies to distract Sora so he can escape, allowing him to continue with his plans of infesting the world with Heartless for Sora to defeat, which would in turn feed Kingdom Hearts. It is thanks to Xigbar that the Storm Rider Heartless was sent after the city. Xigbar makes his next and last appearance at his home in Organization XIII's headquarters in The World That Never Was, where he accosts Sora and friends in the Hall of Empty Melodies. As usual he presents Sora with jocular riddles behind which lies a plethora of knowledge about everything that has passed; he tells Sora that he isn't "half the heroes the others were", an indication to him knowing Terra, Aqua and Ventus ten years prior when he was still the human Braig. During the same speech he stirs trouble again by calling Sora ‘Roxas', confusing the Keyblade Wielder as Sora doesn't yet know who Roxas is, before Xigbar engages in battle with the trio. Despite his extreme skill, he is destroyed by the heroes, but not before he has the last word as he refuses to tell Sora who Roxas is. The wisecracking Number II of Organization XIII, Xigbar seems to be nothing more than an old smart aleck who prefers to keep away from the politics of the Organization. But underneath that ruse, and unbeknownst even to Xemnas and Saïx, he knows more than any of the others suspect; using his ability to manipulate space and gravity, he is able to eavesdrop on any conversation, see every hidden action. Utilizing this power, he comes to know secrets that no one - sometimes not even Xemnas - had any idea of, including Xion's nature as a part of the Replica Program. Not a trace of this shows around the other members, though; to the rest of Organization XIII, he is only simple, laid-back Xigbar. Both inside the castle and in the field, Xigbar keeps a close eye on Roxas and Xion whenever he can, generally giving the both of them a seemingly "good-natured" hassle with his jokes and nicknames. Xion generally takes his jibes and mischief in stride, while on the other hand, Roxas angrily protests every time he calls him "kiddo" or "tiger". Xigbar's nickname for Xion, in turn, is "poppet," a secret jab at her true nature as a Replica. It is because of that nature that Xigbar sees Xion differently than any of the other members. His memory dates to the time before even Ansem and the Apprentices, the time of the last Keyblade wielders who traveled the worlds, therefore making her look like the Keybearer Ventus, who - interestingly enough - looks exactly like Roxas. What exactly this implies, about both Xion and Xigbar, only time will tell. True to his title, the Freeshooter utilizes twin arrowguns in unison with gravity-bending acrobatics, all at long range, to lay waste to enemies without ever having to suffer a single scratch. Xigbar is capable of sustaining a constant barrage of deadly accurate fire, pausing only to reload, and what these individual attacks lack in strength or magic power is more than made up for in speed and quanitity. In reverse, his Limit Break, Critical Snipe, combines his two arrowguns to form a single sniper rifle, with which he can take aim and unleash magical bullets of less speed, but furious power. 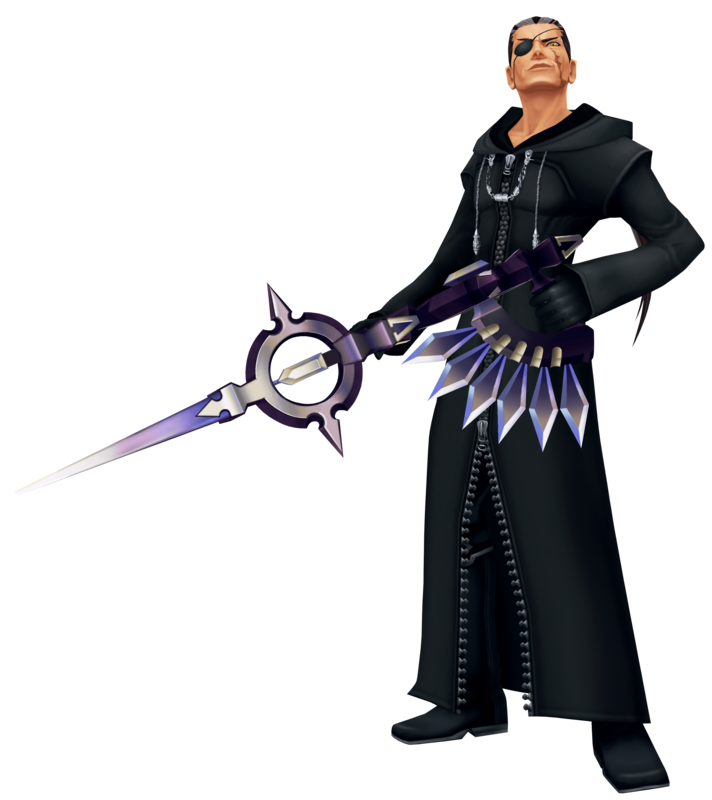 Xigbar ranked as Organization XIII's number II, and when he was still human, was one of Ansem the Wise's six apprentices. He was Xehanort's biggest co-conspirator, helping him corrupt Terra with darkness and ultimately take over his body. Xigbar was defeated by Sora in The World That Never Was and has since been reborn as the original being, but having long since abandoned his name and past life, the only entity that exists is "Xigbar." The freeshooter greeted Sora with a surprise visit the instant he arrived in The World That Never Was, taunting him with the knowledge that they had planned everything from the start; what he'd do, which worlds he'd go. They had always been watching him in some way, shape or form, guiding him wherever they wanted him to go. Sora won't be able to return home ever; he'll be trapped, forced to play the role as their puppet. Remaining defiant and headstrong, Sora refused to submit to their plans without a fight. Unfortunately for him, Xigbar would not be his opponent and he departed, leaving the Keyblade wielder with a familiar face, the silver-haired man he had met several times through his journey: young Master Xehanort. Xigbar returned when Sora had almost fallen into the deepest abyss, laughing at how they had sent him deeper and deeper into the dreams and almost woke him up in the process, and about how great hearts are for steering them in the wrong direction, just as Sora's did to bring him to this point. As Sora chased the dreams, he realized that Nobodies did have a heart, and in response, Xigbar just mocked him for being so slow to notice. In perfect timing, Xemnas joined the party and together he and Xigbar revealed that the ultimate goal of Organization XIII was to connect all the members to Kingdom Hearts and fill them with the same heart and mind, turning them into 13 copies of Xehanort, of which Xigbar was already half of! Sora was enraged that they would dare talk like that, fooling their comrades for personal gain when it's the connections with others that make a person strong. Taken aback, Xigbar left Xemnas to deal with Sora, and retreated in his rage. Gathered with the other seekers of darkness as they awaited the arrival of Master Xehanort, Xigbar watched Riku and Mickey's futile effort to protect Sora from falling to darkness, smiling with glee as they would finally accomplish their goals since they came together over a decade before. What he didn't expect was that Lea had joined their side, and realizing that the tide had turned, he angrily confronted Xehanort, demanding to know what they would do. With the time run out, they had no choice but to depart and reconvene later.